Antiques challenge. James Braxton competes with Catherine Southon at an antiques fair in West Sussex. It's a difficult day for both as they struggle to find profitable items. 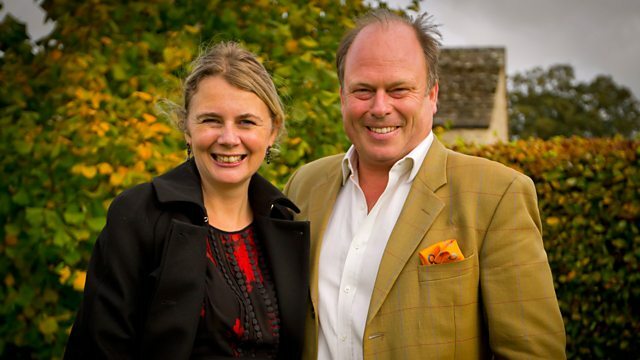 Browse content similar to James Braxton v Catherine Southon - UK Antiques Fair. Check below for episodes and series from the same categories and more! experts against each other in an all-out battle for profit. most money from buying and selling. First Lady of the Lots, Catherine Southon, at a Sussex antiques fair. I wanted to buy one, ended up with five. I have come out and bought four. ..and James banks a purr-fect profit. You can have the kitten and I'll take the cash. That would be lovely. -This is Put Your Money Where Your Mouth Is. Welcome, one and all, to another day in the sunshine. fooled - there's nothing quiet or quaint about today's challenge. be crowned king of the collectibles, or queen of the curio. but he isn't afraid to get his hands dirty. On home turf, here in Sussex, it's James "Bingo" Braxton! Everywhere I go is opportunity after opportunity. I can't stop buying! Taking him on, the corporal of collectibles. She's gunning for a deal and is skilled in the art of negotiation. Come on, Bingo! Catch me if you can! our duelling dealers will need to be like profit seeking missiles. and any profits they make will go to their chosen charities. and Catherine Southon, Put Your Money Where Your Mouth Is. -Yes, you always see different things here though. Always something a little bit special and so much ground to cover. -750, a lot of cash there. -A lot of cash, burning a hole in the old pocket. -So, are you going to be in or out? -I'm going to be outside. It's going to be a lovely day. Top up the old tan. I'm a multitasker. -I'm going to be mainly outside. I might touch on inside. -I'll see you a bit later. but Canny Catherine is hoping to get one over on old Bingo already. but in fact I'm going in straightaway. and I don't think it will today. Ooh, it's going to be that sort of game, is it? because Bingo is drawing up his own plan of action. My strategy is to find the house clearer. but I want somebody who's arrived today with a van full of goodies. but with so many stalls to see, they need to hit the ground running. it's not long before Bingo finds himself drawn to a garden table. Rather like a moth to a flame, I'm drawn to the three-legged table. There's something irresistible about these. Normally painted top. one. They're normally circular, like its neighbour next-door. sort of purchase for £50 or £60, but let's find out the price. -What price do you have on this? -75? Could you do 65? 65, I can do, yeah. 65, you have yourself a deal! And it's one-nil to Bingo. Good work, old chap. bit of filling, and I have a lovely table - £100 table maybe. So, James has one purchase under his belt. Across the market, his arch rival is poised to head inside. I'm going in and I'm buying. I will have bought three items, I promise you. and she pounces straight on a boxed painting set. Can I give you 50? -55 and you've done it. -50 and I will take it away. 55 and you get a posh carrier bag. Mm, she doesn't hang around. First buy in the bag and a posh bag at that! I've just bought this lovely little travelling artist's set. -Yes, otherwise known as "outside"! Anyway, these little tubes retail at about £2 each. Some really nice good quality brushes and the palette as well. It's all complete, it's all there, and it folds up really nicely. All I have to do now is find an enthusiastic landscape painter. So, savvy Southon's made it one-all. so the next logical thing is to buy a set of rusty chairs. I love these chairs. Why do I love these chairs? They're work, aren't they? Look at them. They're rusty. They're quite sweet, aren't they? But they're French, 1960s. table and sell them to a little cafe, restaurant, outside. -Do you know they're definitely tailor's ones? Someone explained to me once how it worked. It was complicated. -It goes in one ear and out the other! -Can I give you £20 for it, sir? I will have paid more than that for it, unfortunately. I'll give you 25 for it. and spent £190 on yet another table. I like it! Six-legged table. It's engineered, isn't it? Rather like those Edwardians, Victorians, those great engineers. This was the time of the great housing explosion. those lovely red brick homes we see today. This would have filled them. and it's something I want to keep, but I know I've got to sell. but his sharp-eyed opponent is showing no signs of stopping either. she's just sealed the deal on not one, but two pieces of jewellery. and elegant and they really have the look. and I think for £20, people will be queuing up to buy these. brooch in the form of a bee. people are still going for these. They are more collectible than ever. but for £60, it's going to fly away to sweet success. and she's rather proud of herself. and our agile auctioneer soon homes in on an antique lawnmower. Time to get in touch with his inner Titchmarsh. This is lovely, isn't it? Just a lovely action, isn't it? -And what price do you have on this? I rather like the blades. Is there any movement? -A tenner, that's about as far as I want to go. -I'll buy it for 80 quid. and he's over the moon with his antique mower. I'm loving this item. Look, the Pennsylvania. It's a lovely edging mower. So, this is going trickling along, next-door to your herbaceous border. they're quite stiff on the ground, old lawn fanatics. the mechanics are still sound. I think I've just got the man for this. At £80, what's it worth to a fanatic? 150? 200? Maybe even three! Ah, yes. Aim high - that's true Braxton style! let's take a look at the figures. Our experts each arrived with £750 of their own money. James Bingo Braxton has been quick to splash the cash. giving him another £375 to spend. leaving £590 in her kitty. Before their buying bonanza continues, time to compare notes. -Oh, thank you, James! So, how's it been? Very good. Everywhere I seemed to go, I seemed to like something. in there, but then, all of a sudden, bum-bum-bum-bum, done. -Lots of bums, yeah. So, pretty good. -And I'm quite pleased with the items I've bought. Whether I've bought them for the right price or not, we'll find out. We'll see. How's the tan going? so it's a tan without perspiration. lined up and you're going to be beautifully bronzed. Not just bronzed, but mahogany! Ah, the colour of a true furniture fanatic! So, pleasantries aside, the battle continues. Catherine's joining her opponent in the open air. Bingo had better watch his back. This is probably a time for a bargain. Why not sell it, rather than pack it? something that's in the back of a van. Southon is hoping to tee up a profit with an unusual walking stick. -It's what they call a Sunday stick. -You go out for a walk on a Sunday, golfing! -Golf was banned in Scotland through the Church on a Sunday. And pretend, when no-one was looking, give it a quick whoosh. -Evolved into a fashion item. -Yeah. 1910 at the latest. -Yeah. And what is the very best you can do on that? 95 and I'll buy it. and she's sure it's a hole-in-one! I cannot tell you how happy I am with my Sunday stick. but it's one that I will never forget, for sure. This is late 19th century. because I think this one will certainly be a winner. Seeing unusual items like this is why I love this business so much. and Bingo's thinking out of the box. Or should that be the basket? Could you do me a really cheap cat basket? The damaged one, that one's £11. My Jack Russell's abused it and loved it. -So, pre-loved is pre-owned, is it? -So, what could that be? A fiver? -You've got yourself a deal. It may not be his usual flavour of antique, but never fear. Bingo is a man with a plan. I live next-door to a cattery - it will be perfect for them. A fiver for a pre-loved cat basket. It's not too expensive, is it? the sign of a true profit hunting professional. But what will his rival make of it? Do you like my little basket? The door... My pre-loved door slipped and it disappeared. -James, I think that's absolutely brilliant. -Is that what people like? How much should I charge somebody for that? It's got to be £40, hasn't it? Surely, to buy something like this in the shops is about £40, £50. -I don't know. I don't have a cat. I live next door to a cattery - I thought I'd sell it to them. -You are a smooth mover! -50 quid, I think. Don't you? it seems he's left a rather concerned Catherine in his wake. and the last thing you buy can be the hardest. And quite frankly, I'm struggling. The middle's been fine. The beginning and the end have been hard. This has been a first class antiques fair. Everybody's packing up, so I'd better get on post-haste. sprint around the stalls, as they search for a final killer deal. swoop on a potential profit, as he spots some wooden drawers. -So, how much are your drawers, then, chief? -Is that a good thing? Being deeper? -I think it may be, yeah, you know. The other ones can only fit thimbles. -How much for all five then? £20 apiece and like, individually...25. -I tell you what, can I buy that top one for 20 quid? -You're not too far out there at all. -Pleasure. You know what's going to happen though, don't you? to think, "I wish I'd have bought..."
I know. I'm going to repent at leisure. -You think I'm being a fool, do you? Like I say, I've had quite a few of them and this is what's left. Could you do the other four at 70? -They're rough as houses, aren't they? -We'll have a deal at that. You've wisen-ed me up now! and James walks away with all five drawers. ended up with five, and each one contains 96 divisions. They will have come from an electrician's. everything was assembled, before they were all on circuit boards. The 96 divisions cheers me up. The five rather bashed drawers gets me rather down. and with that, he decides to call it a day and plan his journey home. and I wish I'd found this trusty white steed earlier. Nice tip there, Mr B, but remember to return the bike, eh? and she appears to be following in Bingo's footsteps. -Yes. How much is your bread basket? -Shall I be really honest with you? -You've got to be, haven't you? -I have got to be honest with you. There's absolutely no way I would pay any more than £5. You ARE actually going for profits here, aren't you? It's the end of the day, you're trying to pull something out the bag. Have you made a mistake? -Have you overpaid for something? You're trying to get it back on this basket. -I don't know. It seems like a low offer to me. -You can have it. Give us a fiver. -Yeah, I'm feeling sorry for you now. and gets a great deal, but was it a wise purchase? The big question - why - jumps out at me. -who has a space on his shelf and needs to this to fill it. So, now, both our experts have a basket to sell. Prepare for a war of the whicker! Before they come face-to-face, let's take a look at the numbers. James and Catherine each arrived in Sussex with a budget of £750. James bought six items, costing a total of £470. Catherine also made six deals but spent very modestly - £260. they get to check out each other's treasures. -difficulty as I have had today. -Am I allowed to say that about your items? It's not the finest antiques haul. I like this sort of putter. -What's going on here? A club. -A walking stick. Apparently, it's a Sunday stick. -You weren't allowed to play golf on a Sunday. -Oh, don't even go there, James. -Do not even go there. I don't even... Can we not talk about that, please? I bought a basket and I don't even like cats! -I tell you what, that is a corker, the mowery thing. -That is lovely, isn't it? -£95. I like your oils. -These are palette knives, are they? -There's some good brushes there. -I like a palette knife. Look at that. And a good selection of oils. and prepare to unleash their inner selling supremos. their items and haggle their way to tip-top prices. Back at Braxton Towers, James is feeling manly! Look at my items. They're quite sort of macho, aren't they? A rather odd purchase from me - a cat basket. Hm. Chairs. They've got a bit of style about them. that I bought for 65 and it would be perfect for a cafe. Lawnmower. I love this lawnmower. It's an edging lawnmower. Looking forward to selling that to a lawn enthusiast. And then my table. Why have four legs? Why not six? This has got six. home, it would sit very well in. And then these fellows. I want to try and double my money on those. I think we'll feed that on to an antique dealer. It's for somebody who can add more value to it. and she went for that bread basket. Let's see who makes the most profit. My cat basket or her bread basket. Oh, that sounds like a challenge. I think that I may have gone down a slightly masculine route. It all feels a bit kind of woody, now that I'm looking at it. The thing that I'm most happy with has to be my Sunday stick. to maybe someone at a golf club, someone with a golfing interest. go for it, but the piece that I really love has to be this air box. take it out and paint some beautiful landscapes with it. and I bought a bread basket. I will easily double my money, if not triple it. My delicate bee brooch. I think that I have a jeweller in mind for this. I was really happy with these Deco earrings when I bought them. and I think it might put a lot of people off. but let's just hope they make me a sparkling profit. hotshot negotiating and sizzling salesmanship. Remember, the most profit wins. as she decides to start her profit quest with her sparkliest items. but Canny Catherine has a plan. who specialises in costume jewellery. I can sneak the Deco earrings in as well and hope that she'll buy both. but this canny woman's aiming for a double deal. -Oh, I'm fine, thank you. Nice to see that you've got a wonderful cabinet of jewellery. -Now, I've brought a couple of items to show you. I bought these. That wasn't a very enthusiastic "right". Mm. Well, they're not very old. -No, they're not old, but I think they're beautiful. -They're really nice Deco-style, aren't they? -The... Oh, OK. OK, here we are. It's going to be a lot of money, I suppose. I'd probably like to do...125. All right, I'm happy with that. -125 is fine. Are you interested in these? They'd have to be very cheap for me to buy them in. -What would you pay for those? -£30 would have to be the death. -Right. OK. So, 30 and 125. I'm happy with that. They're yours. All I need now... All I need now is a handshake and some money. -Wonderful. Thank you. That's easy. a profit of £10 on the earrings and a buzzing £65 on the brooch. Two items sold, two profits. What do you think about that, Bingo? Meanwhile, in Sussex, James' first customers are waiting patiently. They sense their master approach. the garden fence with a cat carrier in hand. Yes, it's Bingo "Basket-man" Braxton! Sue, who runs a very smart luxury cattery, a sort of cats' hotel. When she hears the price, let's hope she doesn't have kittens! -Hello, James. How are you? -Nice to see you. You well? And who's your little occupant in here? ..who just arrived yesterday, so he's just settling in. I bought this very much with you in mind. Is this a familiar object? We have seen one or two, yes. Bang on trend, this. Bang on trend. -Shabby chic, I think we say. Now, if I said to you, Sue, £60, would you think I was barking mad? -Barking mad is a good thing to say in a cattery. It's not the perfect price. -I tell you what, Sue, special price, 40. -It would be very useful. £30 and you've got yourself a deal. -Well done, Sue. It's yours! -A prize basket. Treasure it! -All I need is a kitten to put inside. -You can have the kitten and I'll take the cash. That would be lovely. Bravo, Bingo! That's a profit of £25 on his very first sale. That was a purr-fect profit. Beat that, Catherine. but Bingo is not stopping there. That rusty metal table and chairs are next on his hit-list. £110 on them at Ardingly, he needs to unleash his best selling pitch. -Hello, Andre. Very nice... Very good to see you. sort of continental three-legged tables, which I love as well. On the whole, they always were quite popular, even in the past. I'm putting the chairs with it. They're still sound, in spite... I like the sort of, that salty patina. in the sea for a bit, don't they? 115 and it's all yours, all five items. -110! 110, I said, come on, come on! I'll write you a cheque for it. he's way behind in the profit stakes. to show art teacher Roger. I have brought you, I believe, an air box. -Is that what they call them? Gosh, this is a substantial box, isn't it? -Right, OK, do you have one? I don't have one quite like this, actually. It, erm, looks very nice. I like the aspect of it. -..to hold it. And it's also lined. I would like somewhere in excess of 100. Let's say 80. Could we go 80? -Could we go 90? That's a nicer half? -Go on, then. 85, that sounds good to me. Yes, that's another £30 into Catherine's profit purse. a dealer in Hungerford for a profit of £10. just how far ahead of Bingo is she now? Let's have a look at the books. James has so far sold three of his items but only made a profit of £30. But Catherine has stormed into the lead. She's struck four deals and taken a decent profit of £115. still to sell, Bingo isn't giving up any time soon. but he's hoping his wooden table will be much luckier. on the sunny Sussex coast to show it to furniture dealer Robert. put this table on. You are packed here, aren't you? Right, we are a little bit, just a bit! -..mahogany and, er, bit of rosewood. -Well, I think it is. I think definitely the shape. -It's not one of those dull Edwardian ones, is it? It's got that sort of Arts & Craftsy look about it, which is fun. Anyway, Robert, the nutty business price, I wanted £280 for it. I could give you two. -It's in nice condition, I'm not knocking the condition. Could you narrow your margins a bit for me, Robert, and do 240? there's a very small profit in that for me at 200 quid. -220 and we'll touch hands. but it doubles his total so far. and Robert was jolly lucky to buy yet another item of stock. But, in the end, a good little working profit. canny Catherine swoops in to conclude the war of the wicker! OK, Bingo, this is war! You've got a basket, I've got a basket. I'm in Sevenoaks with mine. Who's going to make the biggest profit? and Bingo has already banked £25 profit on his. so let the Battle of the Baskets commence! -Hi, you must be Tim! Right, I bring you gifts. -the kind of style that we have, so, yeah. -Yeah, it's quite a rustic theme, isn't it? -Yeah, no, I like it. OK, so it comes down to money. How much? Er, I'll give you £15 for it. Would you make it a nice round 20 and make me very happy? I would give you £15 and make you a nice coffee. Yes, that caffeine addiction has cost Catherine dearly. which makes Bingo King of the Wicker! who runs a garden machinery company. Look at this - poetry in motion! -I think I'm strimming your vinyl. Viv, hello. -Hello, James. I'm Viv. Hello to you. -Well, you've had that long time, obviously. Yeah, I've come to the right place. -Viv, you are the expert. Is it for mowing the edges between the grass and a border? -It's actually for up against a wall. to tidy all the edges up. That would go right down... And, specifically, for gravestones. Every churchyard would have one for cutting around by the gravestones. Can you...? Have you seen many of these? I haven't seen these before, but you can still get them. -Yes! It's in remarkably good condition. They were last made in about 1960. -Yes, they were made from about 1927 to 1960. Anyway, Viv, you would make my day if you gave me 120 quid for this. All right, James, you've twisted my arm. You could have £120 for it. Viv, you're very kind, indeed! What a great salesman - not even a counterbid! And at £40 profit, it's Bingo's biggest deal so far. and he's headed home for this one. The man I'm awaiting, I've known for over 30 years. so it's two gentlemen of the parish clashing. Anyway, we're going to clash over these five drawers. in the hope of enticing dealer Lloyd to buy. this is before and after, OK? Did you paint this was a loo brush with no bristles? -which I probably shouldn't have done. What do you see? How do you see them, Lloyd? Well, we have a pair of drawers and one free. -Two for the price of one. -OK, OK. Shall I put that away? I know it's slightly offends you. So we have now a pair and a pair. You can get that free. I was thinking 90 a pair. £30 pair and that is a £60. Can't be done, James. It's madness. What are we going to put these holes? I'll give you £80, end of story. but he's still feeling chipper. That was the last sale. but have I possibly won the campaign? I can't wait to find out, Catherine. and it's been causing her sleepless nights. trying to sell this Sunday stick. but that didn't prove possible. to see leading cane specialist Dominic. so there's a lot riding on this. -It's lovely to be here and see all these canes. I have never actually seen so many canes, all in one place. I'd love to know how many have you actually got here? Well, it's a frightening question, and we're asked it often. And the truth is, I don't really know. -"Oh, I've got 50 of those. I don't need it." Is this a Sunday stick? You're absolutely right, it is. That's exactly what it is. and this one is one with a traditional wood head. Sometimes they come with the iron head. But primarily they were putters. -So, it's a novelty cane. -Which had a sort of added bonus. And also, it's a good one because it is a genuine Sunday cane. Sometimes they're just golf putters turned upside down. So, is it something you'd be interested in? -and you better tell me what you're thinking of. I paid £95 for this. OK. All right. Well, that's really kind. that it is coming to you, to the right person. I think it will sit beautifully with the other walking sticks. Well, it will eventually go to a very good home, I'm sure. I'm sure. Hopefully, a golfer. Indeed. Somebody who could practice. and with that our daring duo are sold out. let's remind ourselves of what they spent in Sussex. Both our experts took £750 of their own money to the antiques fair. of her budget, at £260. But now the name of the game is profit. Fine, thank you. And yourself? It was the basket challenge. So I had to buy one myself. £25. Is it going to be an omen? Omen! Ooohh! What about the rest of your items? and I sold that to an artist. I was hoping for a bit more, but didn't quite get there. -I don't know what happened that day, James. Was it the heat that got to you? -I don't know. The gin and tonics are on you. and Bingo is left wondering what went wrong. Well, she nigh on doubled what I made! the mighty Put Your Money Where Your Mouth Is showdown! James Braxton competes with Catherine Southon at an antiques fair in West Sussex. It's a difficult day for both as they struggle to find the profitable items, but James invests in rusty furniture and Caroline buys a walking stick with a political story.